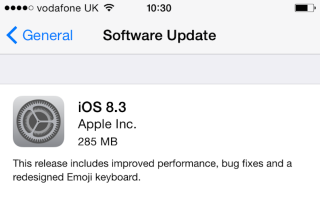 Apple releases iOS 8.3 update, fixes issues with Bluetooth and Touch ID | What Hi-Fi? The latest iOS update brings with it some bug fixes, including better syncing with Bluetooth speakers. Last night Apple released the latest in a long line of updates for iOS 8 (there have been eight in the last six months). iOS 8.3 fixes a number of bugs including problems with syncing audio playback through some Bluetooth speakers. Initially users on Apple Support reported that the latest update caused problems with Touch ID on iPhones and iPads when making purchases on iTunes or in the App Store, but that now appears to have been fixed. Some problems with wi-fi, causing devices to disconnect and then unable to reconnect, persist, despite Apple claiming that iOS 8.3 fixes the problem. It seems the fix works for some owners, but not all. Enhancements brought in with 8.3 include racially diverse emoji, wireless CarPlay support (so you no longer need a Lightning cable to connect your iOS 8 device), more Siri languages, an upgraded iCloud Photo library and a speed boost when launching apps. Have you experienced any problems with iOS 8.3? If so, let us know in the Comments box below.